Japan’s weak yen policy could be South Korea’s biggest economic enemy this year. The strengthening won, which has risen 23 percent against the yen in the past six months, was partly to blame for the country’s anaemic GDP growth in the fourth quarter. It’s also putting the squeeze on manufacturers like Hyundai. Lower interest rates could help to ease the pressure. An appreciating currency is a big dilemma for South Korea’s central bank. Investors are betting the Bank of Korea’s policy interest rate of 2.75 percent, which it last reduced in October, will remain unchanged as the incoming government of President Park Geun-hye boosts public spending in an attempt to revive growth. But the wait-and-watch approach is risky because it could engender expectations that the central bank is not particularly worried about the country’s exports losing some of their price competitiveness. With the likes of Hyundai and Samsung competing directly against Japan’s Honda and Sony, a cheaper yen will undermine the profitability of Korean exporters. The surprise 6 percent drop in Hyundai Motor Co’s net profit in the final quarter of 2012 underscores the risk. And now that the Bank of Japan has agreed to support Prime Minister Shinzo Abe’s plan by printing 13 trillion yen ($145 billion) in new money every month starting in January 2014, the yen could weaken further. There is nothing wrong with Andy’s observations as such. It is obvious that Korean and Japanese eletronic and cars producers are major competitors in the global markets and Korean exporters are likely suffering relative to Japanese exporters. That said Andy’s comments smells of currency war-rhetoric, which always worries me. In that regard I will make two observations. First, the aggressive change in monetary stance from the Bank of Japan is likely to give a major boost to the second (or third) largest economy in the world and is therefore likely to be good news for the global economy and particularly for the Asian economies. That certainly will help Korean exporters. Second – as I have argued in the case of Mexico – no country is forced to import monetary easing or tightening. Hence, the Bank of Korea (BoK) is completely free to conduct monetary policy in way to serve the interest of the Korean economy. If the BoK don’t like the strengthening of the won it can simply counteract it with monetary easing in the form of interest rate cuts, quantitative easing or intervention in the currency markets. Hence, in my view the BoK can alway “neutralize” any impact on the Korean economy from the strengthening of the won. The continued strengthening of the won obviously is a sign that Korean monetary conditions are tightening and judging from recent economic data the tightening of monetary conditions certainly is not welcomed news – rather monetary easing is warranted. However, the reason is not really the performane of Korean exports – in fact the Korean export performance has been quite strong in recent years and export growth actually remains fairly high. 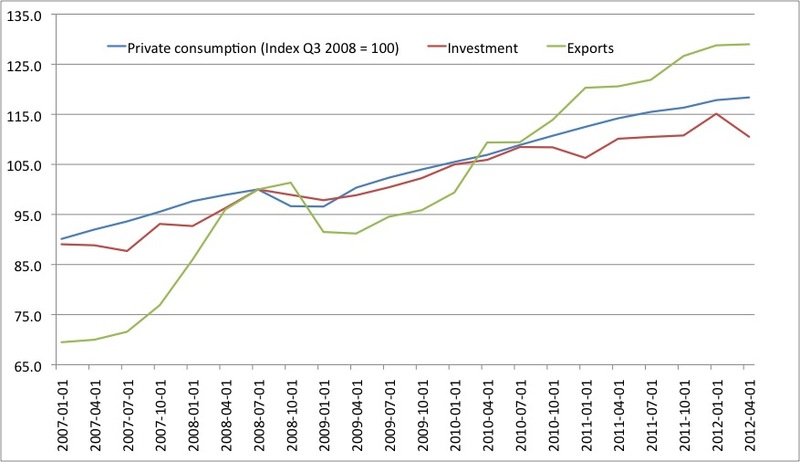 Contrary to this domestic demand has been slowing and especially investment growth is weak. So once again I think it is useful to see the currency as an indicator of monetary policy “tightness” rather than a cause of the problems in itself. The strengthening of the won is a clear sign that Korean monetary conditions are getting tighter. But the worry is not really on the export side of the economy – even though I readily admit that Korean exporters are suffering at the moment – but the real worry is the slowing domestic demand. The graph below illustrates that. Obviously central banks should not concern themselves with the composition of growth , but that of course do not mean that the BoK should worry at all. With inflation slowing to just 1.4 percent in December, much lower than the central bank’s target range of 2.5 percent to 3.5 percent, the monetary authority certainly has the scope to reduce interest rates. The Bank of Korea should grab the lacklustre GDP figures as an opportunity to give the economy another monetary boost. So judging from BoK’s own inflation target monetary easing seems warranted. 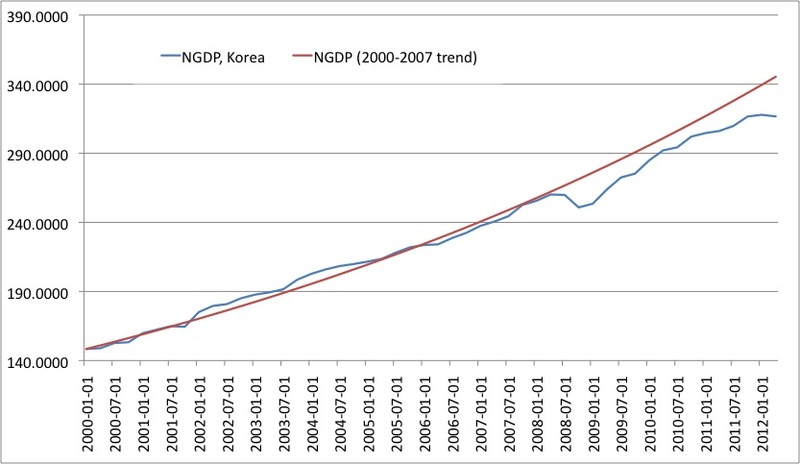 The story is the same if we take a look at the ultimate Market Monetarist benchmark – the development in nominal GDP in South Korea. The graph is pretty clear – the BoK more or less managed to bring back NGDP to the pre-crisis trend level 2009-10, but since 2011 NGDP has been “softening”, which clearly indicates that monetary easing is needed. Beware of the Zero Lower Bound! With the BoK’s key policy interest rate at 2.75% there is still room for use it’s “normal” monetary policy instrument to ease monetary policy. That said, in an environment where the won is strengthening significantly the BoK first needs to “neutralize” the effect of this strengthening with rate cuts and then additionally needs to ease “on top” of that to push NGDP back on track. That could in a negative scenario easily bring the BoK’s key policy rate down close to zero. Just imagine a new escalation of the euro crisis or a new financial shock of some kind. In such a scenario the BoK would be unable to ease monetary policy further through interest rate cuts as interest rates effective would hit the the zero lower bound (ZLB). While we are someway away from the ZLB in Korea it is also clear that the risk of hitting it should not be ignored. In fact I believe that the zero lower bound should be a bigger worry for the BoK than the BoJ’s monetary easing. Luckily the BoK can do something about it. The most simple thing to do is simply to pre-announce what policy instrument it will resort to in the event that interest rates where to get too close to zero. A possibility is simply to state that if interest rates hit zero then the BoK will switch to a Singapore style monetary policy, where the central bank conduct monetary policy through the exchange rate channel. A pre-announcement of this sort would likely avoid bringing the BoK in a situation where it actually would have to intervene in the FX market as the markets expectations of FX intervention would on it own lead to a weakening of the won. This effectively would be what I have called McCallum’s MC rule.